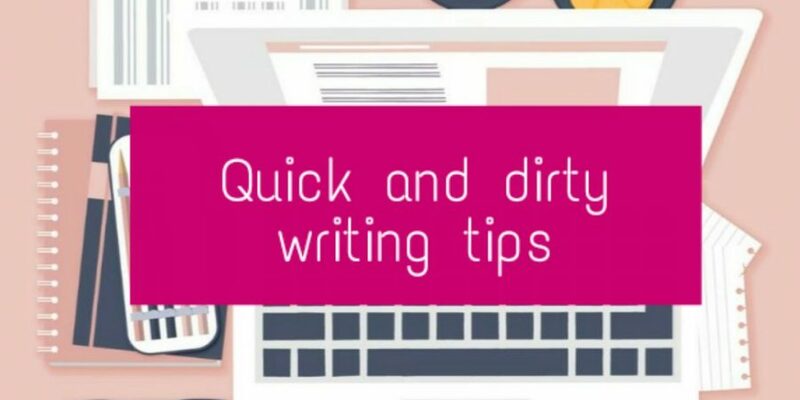 Quick and Dirty Writing Tips - M.W. We all want to be productive when it comes to our writing. The sooner we get published, the better. But first we must have the stories and in order to have those, we must sit down and WRITE. My previous post was about the guilt of not writing and this post provides some quick and also some quirky tips on how to stimulate your writing. After all, time is precious and our characters are fickle bastards. Unless maybe they are a demon in disguise. My point is, our attention span doesn’t work that way. There are moments where we are more productive than others. You could use something like write or die to do a writing sprint, because in my experience short bursts are the best. After writing two hours, my mind wanders, no matter how excited I am about the new clues my sleuth is gathering. Of course, you could write one or two hours in the morning and one or two in the evening. You don’t have to write once a day. Find what works for you. This may be a quirky tip, but it works! To get in the writing zone, I usually burn my favourite incense. Music can also help. To this day, I still think of Lara Croft when I smell bergamot oil because that’s the essential oil I had wafting through my room when I played it. I also think of Beyoncé, because I remember I played one of her songs on repeat. The point is, smell and music can form strong associations and if you burn the same incense or scented candle ONLY when you sit down to write, that can trigger your muse each time you smell that it. Sitting down at the same time during the day or week will also help to establish a routine. How To Celebrate Finishing a Book - M.W. Previous Post Should You Feel Guilty When Not Writing?